OK, everyone close your eyes. On the count of three, open them and bestow upon yourself one of the most intense RX-7 builds to date. Ready? OK, 1…2…3…open! You peaked didn’t you? Anyway, pick your jaws up from the floor so I can continue this post. Every time I think this guy has outdone himself, he comes through with yet another build for the books. 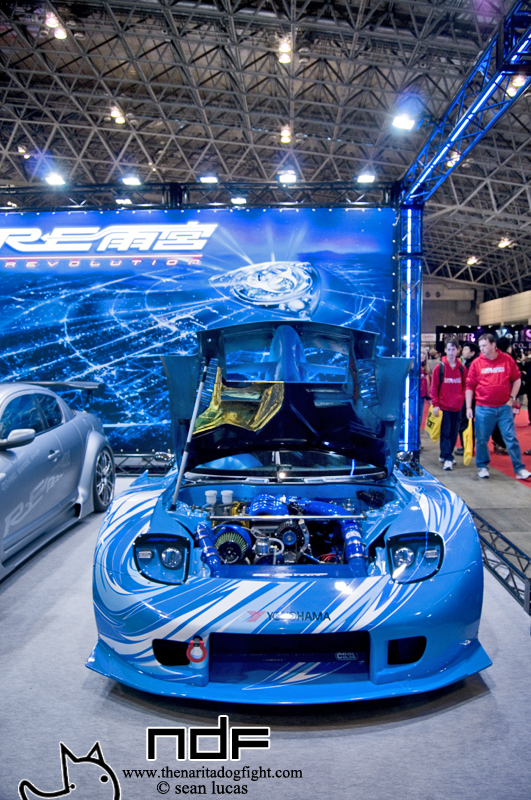 The RE Amemiya built NA Super-7 is hands down one of the greatest FD builds I’ve seen to date. The beauty, of course, lies in the extensive body work that Isami Amemiya is known for. Click past the break to get up close and personal with the curves – courtesy of JDM Clips. Let’s pull back a bit on that opening shot. Honestly, I’m not even sure where to begin with this thing. I thought last year when I went to TAS that RE-Amemiya had outdone themselves with their ‘Revolution’ booth rocking multiple 7’s and one crazy 8 that they brought out. Well, they came back in 2012 swinging hard. I mean, you sort of expect this kind of thing from Amemiya-san now, but this blows me out of the water. I’ve always been on the fence as far as Amesan’s builds go, but this one is too smooth not to like. If I had to critique this car in some way, I would probably have to address the front end first. On one hand, I love how the hood and fenders actually become part of the front fascia. The negative side of that is that it begins the flow of the car too abruptly; almost as if the front could be the rear. I am a fan of the huge vents in both the front and rear that expose the tires on both ends. Facing the car head on gives the front end an entirely different look. I can’t imagine the hours that went in to making this car’s body panels so perfect. It seems that not one of the original pieces exists. Same story around back. It becomes apparent just how much wider the body is that OEM when you view it from the rear. Huge vents in the rear bumper and integrated taillights play into the theme of the build. You’d be wrong if you said this was just a show car though. Like typical Japanese builds, the engine get’s the full treatment as well. In this case, the NA Super-7 gets a fully tuned 13B-REW. The Hyper Black Enkei GTC01’s fit not only the style of car, but the color as well. I love how the body wraps to hugs the wheel and tire. While I’ve stated before that I’m not always a fan of what RE Amemiya produces; I’ll be the first to admit that this is nothing short of beautiful. If anyone has any further information on it, or if someone could find some progress photos I would definitely be grateful! As always, thanks for visiting! Stick around for more JDM Clips coverage of TAS 2012! See you soon.